Leslie Pina Furniture in History: 3000 B.c. - 2000 A.d.
Furniture in History: 3000 B.c. - 2000 A.d.
Furniture in History 3000 B.C.-2000 A.D. takes a new approach to a very old subject. By focusing on the constant theme of innovation and change, it discusses the history of furniture in the West—from ancient times to present. Its excellent coverage of modern periods, designers, and styles gives the book a depth and breadth not found in competing texts. Redesigned in this edition, it includes hundreds of illustrations and new photos from a variety of sources—including the Cleveland Museum of Art. Each chapter includes chronologies, designer contributions and historical highlights that make it a comprehensive volume on the evolution of style. For courses in History of Furniture, Interiors and Interior Design. 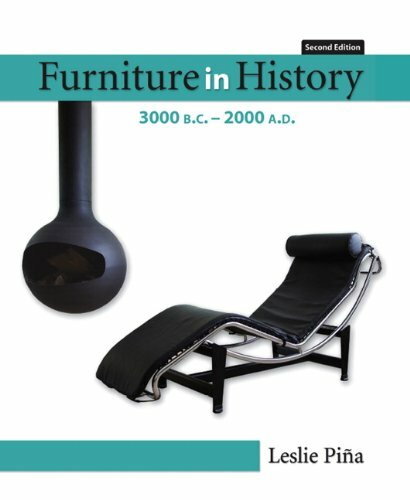 Furniture in History 3000 B.C.-2000 A.D. takes a new approach to a very old subject. By focusing on the constant theme of innovation and change, it discusses the history of furniture in the West-from ancient times to present. Its excellent coverage of modern periods, designers, and styles gives the book a depth and breadth not found in competing texts. Redesigned in this edition, it includes hundreds of illustrations and new photos from a variety of sources-including the Cleveland Museum of Art. Each chapter includes chronologies, designer contributions and historical highlights that make it a comprehensive volume on the evolution of style.